This entry was posted in Uncategorized and tagged flying, Security, Terror, Terrorism by christao408. Bookmark the permalink. maybe I watch too many films – but isn’t it the most easy way to sneak through a security by secretly putting stuff in a grandma’s bag? if the alert level should drop… this whole thing is doing backwards – we need to address the fundamental cause of this – why do they hate America so much? why do they so obsessed with the America as a target? when you have an invisible enemy, how can you fight with them? The TSA is a joke. The bureaucrats who run the entire operation don’t have the experience or the brains to implement security procedures. It’s all a kabuki theater anyways. @YNOTswim – I agree that we need to address the fundamental cause, although I don’t think we can do that to the exclusion of transportation security. It the US was more like Canada (i.e. less interventionist in its foreign policy) we would eventually work our way out of this predicament. If we actively started helping, building schools, constructing hospitals and doing more humanitarian works, we might actually be admired once again. @LostSock21 – If there was someone at some level of the organization who knew what was going on then I’d get some sleep at night. But neither the people running the TSA nor anyone else seems to have much of a clue. i just flew today (and have one more flight to go); so far, i haven’t noticed anything different from usual — no crazy policies about being your seat an hour before landing, or any of those other things you mentioned. i don’t know if not seeing any changes is a good thing or not, though! I have so much to say on this topic and not enough time. This is one of my hot-button topics, in fact.At this point, I could name 30 different ways to circumvent the illusion of security the TSA provides (you know, protecting us from infants on the no-fly list). Even more ridiculous is most people flying fully realize the security is an illusion, making obsessive, intrusive searches even more frustrating. 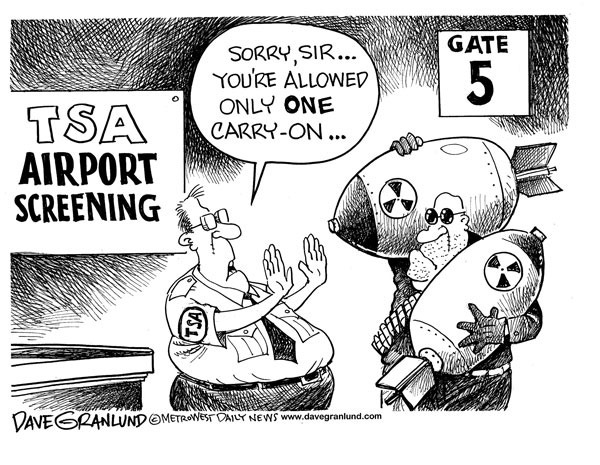 And worse yet, when you take normal people and put them in positions of power and authority (like TSA agents), they will abuse that power and authority to the fullest if they know they can get away with it, or if their orders allow them to. This is by far the best anlytical approach I have read on xanga. I am going to be traveling next week, and rather perturbed about the lines at the security check. I don’t like crowds and confinements. After ten years of “increased security” you would think we wouldn’t even be courting this conversation. It’s a joke to think that we even have any as long as people are able to cling to their prudishness. Seriously, have you seen the images the scanners produce? Who’s going to get aroused by them? I say scan head to toe, no exceptions and keep the lines flowing. There’s just no excuse not to.Your observation about cargo has been a glaring one. It would take very little effort to create another Lockerbie incident.And while we are at it, what happened to the passengers “bill of rights” and why is our safety not a demand at the top of the list?A savvy new carrier would advertise and offer guaranteed security to those willing to pay for it and over time would force other carriers to meet the demand as well. Have a few billion I could borrow so that I could get this idea underway? One more thought is that the more intrusive and yet still ineffective these security measures become, the less I’m going to be inclined to return home to visit friends and family. Those visits may become less and less frequent if the hassle isn’t worth it. I’ll get on video con calls using Skype and save my travel for friendlier destinations.Responding to your comments:@marc11864 – Sir Richard Branson famously said that the best way to become a millionaire in the airline industry is to start with a billion dollars. @Fongster8 – Thanks David. @ZSA_MD – I hope your flights are smooth! @arenadi – It seems you share my frustration with the system’s many flaws. @brooklyn2028 – Very true that many gov’t organizations are ineffective. There are some that manage to do a very good job but those are few and far between. @kunhuo42 – My understanding is that most of those crazy restrictions were aimed at inbound int’l flights and were quickly rescinded as they were obviously impractical. @murisopsis – That’s a good point. Not having a director in place is a problem and blocking his appointment for few of unionizing is downright silly. Of course I am skeptical that this one man would somehow totally reform the TSA…@yang1815 – As only the government can do best. I flew just a few days ago, and the workers were pretty lax with security. I don’t understand why international inbound flights are more of a concern than a domestic one. All I can say is that I agree on all points! I read an article recently about airport security in Israel. They have a completely different philosophy and approach to this. In addition to the usual stuff, they do a lot of questioning of passengers. Everything from body language to eye contact is carefully reviewed. I think the other thing is that the citizens understand why all of this is being done which shuts down a lot of noise about civil liberties and privacy. I agree with you completely. I dont travel often, but it seems that things are getting more and more ridiculous each time I do. Things like not being able to bring a bottle of water onto the plane – unless you pay crazy airport prices – is annoying, but I deal with it. It just bothers me that each time it seems there is some other way of limiting me. I always carry snacks. When I flew in August to San Diego, I had to throw away an entire, unopened jar of peanut butter because it was considered a ‘liquid’. While it was mostly a minor annoyance for me, it is frustrating because the security doesnt seem to really be targeting people they should be. On the same trip, I was picked to search my bags while boarding the plane. We flew Air Tran, so most people had large carry-ons (which is another subject I wont even start on!) and I had only a small carry on and a camera case. I would be willing to bet money that they picked me out of the line because they knew that my items would be easy and quick to search. It would be nice to see some actual security rather than the ridiculousness they put travelers through! I actaully work for TSA and I agree with some of your points. Deploying more of the Advanced Imaging Technology (formerly Whole Body Imagers) is certainly a good idea. But the machine has its limitaions, believe me I am certified on that damn machine. The biggest flaw it has is that do to ‘privacy concerns’ the sensitivty of the machine has been set to the lowest possible. Therefor most of the images are blurry, grainy, or down right distorted. Furthermore, the machine will increase the wait times. This machine is by no means the magic bullet to fix the problem. As for the notion of secondary screening, we must remember that the terrorist are not above using the eldery, disable, handicapped, or children in for their goals. That is not to say that grandpa is in on it but rather that he unwillingly might be carrying a prohibtied item. I know very well about the test you speak of and I agree that many of my fellow officers should be fired. The problem is the new people that get hired are not any better. You get what you pay for. At least here in the DC area on a TSOs salary one could not afford an apartmnet in anything close to a nice area. When somebody gets fired they are usally repalced with another 19 year old from the ghetto. Frankly many people here to not really care. The agency is so badly mismanged that often it feels like we are working against the terrorists, against the passengers, and against our own managers. After awhile that is bound to wear down even the most dedicated officer. I would say the solution woudl to be to increase the TSOs salary and therefore get better recruits but that is a double edged sword. Based on prior preformance most of us TSOs do not deserve a large raise. Yet without a raise the qualityof the recruits will continue to suffer. @DivineCaesar44 – Let me thank you both for your work for the country as well as your thoughtful comments. I appreciate hearing your perspective. It seems that the privacy concerns of the AIT machines can be worked around. If the person viewing cannot directly see the person he or she is screening, I would be in facor of greater resolution and sensitivity. Even if the screening is a bit slower if it is less invasive than the current process, I would be in favor of it.The point about secondary screening is well made and even as I wrote my post I did give thought to that idea. I’m in favor of increased salary if they can be tied to increased performance standards. Thanks again for your work. @der_lila_Stern – I would like a law that mandates that bottled water sold after the security screening must be sold at “normal” prices without any inflation. Or make sure there are water fountains with spouts that can be used to refill empty plastic bottles that we bring through security. Thanks for your comments. @ElusiveWords – ELAL Airlines has never had a terrorist incident. Their security is considered the strictest in the world and also the most effective. In my mind they get bonus points for being effective. That is a fantastic idea. I would love to see that put into place! @christao408 – The current procedure is that the officer that sees the image on the AIT never sees the passenger. They are in a locked off room on a machine that cannot store any images. Furthermore, of said officer brings a camera or camera phone into that room in an attempt to take pictures they are automatically terminated. On a slightly related note I just got back from the testign site where TSA and the bean counters are developing new pat downs. They are not pretty. If you think what we do now is invasive the new ones under consideration are far worse. As I said a salary increase to lure in better recruits is my idea. I doubt it will ever happen. Becuase frankly we do not deserve it. @DivineCaesar44 – Thanks for the update. I’m glad to hear that there is some manner of thought and consideration in evaluating and creating new processes. @Wangium – Back in the more immediate aftermath of 9-11 I was still traveling every week for work. There was a small swiss army knife that I had tucked in a corner of my bag that made it for several months before being discovered. I found it after a few weeks but left it there, curious whether or when it would be found by the TSA.